Shimla (Himachal Pradesh), April 11: In a first, Kashmiri migrants in Himachal Pradesh are all set to cast their votes for candidates back home through postal ballot system, as seven-phase elections in the country begin today. Speaking to ANI on Wednesday, the state's Additional Chief Electoral Officer D.K. Rattan said the Election Commission has provided necessary facilities for migrant voters to exercise their franchise from their present locations in the state. "This is an initiative of EC where migrants from Jammu and Kashmir will get the chance to vote in their registered constituencies via postal ballot. Lok Sabha Elections 2019 Phase-I Voting Live News Updates: Alleged Violation of Model Code Of Conduct as NaMo Food Packets Being Distributed by BJP Workers Outside Polling Booth in Noida. These migrant laborers and other migrants from Jammu and Kashmir will also get another option for voting at one of the three locations of their choice in Jammu, Delhi and Kathua. They will be able to vote at these locations after registering themselves with the portal," he said. Last month, Uttar Pradesh's Chief Electoral Officer BD Ram had said the EC has provided the facility of postal ballot to Kashmiri migrants for the Lok Sabha elections 2019. 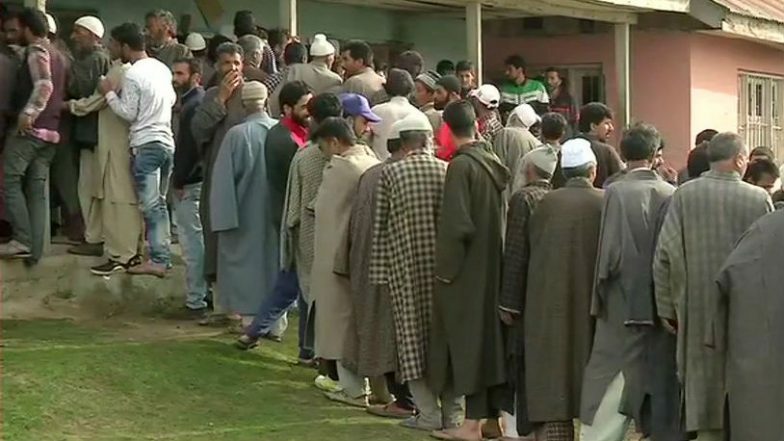 Earlier, postal ballot facility was not available for Kashmiri migrants and they had to go to special polling centers in Delhi and Jammu for casting their votes.Voting for 543 Lok Sabha seats will be held in seven phases - April 11, April 18, April 23, April 29, May 6, May 12 and May 19. Counting of votes will be done on May 23. The first phase of elections on Thursday will see 91 Lok Sabha constituencies spread across 18 states and two Union Territories going to polls, starting 7 am, barring those constituencies which require special security arrangements. Assembly Elections 2019 Phase 1 Live News Updates.